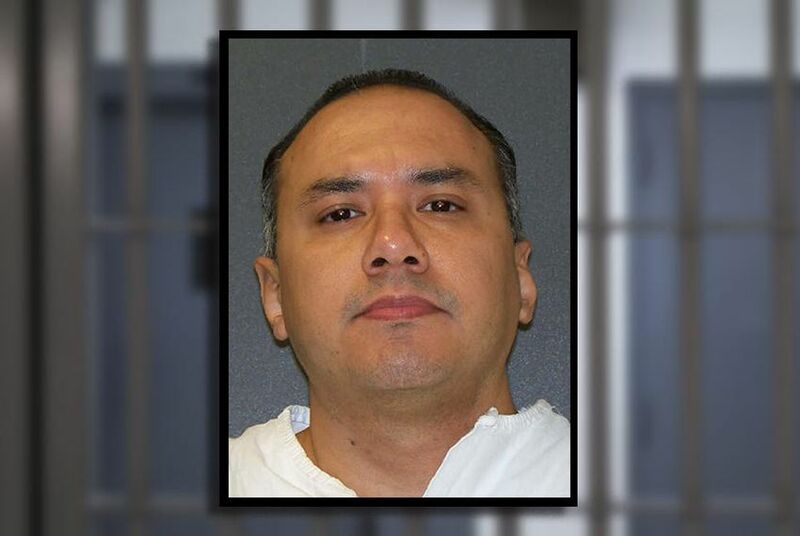 After 24 years on death row, a re-sentencing trial and an escape attempt, Gustavo Julian Garcia, 43, was executed Tuesday evening. HUNTSVILLE — After 24 years on Texas death row, a re-sentencing trial and an unsuccessful escape attempt, Gustavo Julian Garcia was executed Tuesday night. He was 43. Garcia was sentenced to death in 1992 after confessing to the murders of two clerks during separate robberies, according to court documents. On Tuesday, his only personal witness was his spiritual advisor. Family members of one of the victims were also present. At 6:10 p.m., witnesses shuffled from the clear, warm night into the death house, where Garcia was already strapped to a gurney. He was asked if he had any last words. A lethal dose of pentobarbital began streaming into the IV already inserted into his tattooed arm. Garcia, in prison whites and black-rimmed glasses, looked straight at the ceiling with a calm expression on his face. A minute later, he yawned and his eyelids drooped. At 6:26 p.m., he was pronounced dead. It was the third execution in Texas this year, and the sixth in the United States. In December 1990, Garcia, 18 at the time, and 15-year-old Christopher Vargas entered a liquor store with a sawed-off shotgun, according to court documents. They stole money and beer, and Garcia shot the clerk, Craig Turski, in the stomach and head. The two weren’t arrested until a month later, when they were caught at a Texaco where another clerk, 18-year-old Gregory Martin, had been shot and killed. Garcia confessed to the murders, and he was sentenced to death for Turski’s death in January 1992, according to court documents. He was never tried in Martin’s case. Martin’s sister, brother-in-law and friend attended Garcia’s execution. No one related to Turski was there. Garcia’s spiritual advisor, Father Clifton Labbe, stood at the front of the viewing area and stared at Garcia’s face. Garcia’s long stretch on death row wasn’t uneventful. More than six years into his sentence, on Thanksgiving night 1998, Garcia took part in an escape attempt that ended with the death of another death row inmate, Martin Gurule, according to the Dallas Morning News. The inmates crept under a fence, climbed a roof and sprinted across the prison yard, the Morning News reported. Garcia and five other inmates surrendered on the lawn after guards began shooting at them, but Gurule managed to get over the outer fence. He was found dead a week later, apparently drowned in a nearby creek. About two years later, then-Texas Attorney General John Cornyn discovered that psychologist Walter Quijano, who testified at Garcia’s original sentencing trial, had claimed in testimony that Hispanics were more likely to pose a future danger to society, according to court documents. Quijano said he came to that belief because Hispanics were overrepresented in the prison population. Garcia and several other inmates whose death sentences had been influenced by Quijano's improper testimony were granted new sentencing trials, but Garcia was again sentenced to death in 2001, according to the attorney general’s office. In August, a Collin County judge set his execution date. His latest appeal to the Texas Court of Criminal Appeals was denied Feb. 9, and the U.S. Supreme Court denied his request for a stay and new hearing the next day. On his final day, Garcia visited with family and friends, according to the Texas Department of Criminal Justice. “He was complacent,” TDCJ spokesman Robert Hurst said. Texas executed 13 men last year, according to TDCJ. Nine more inmates have executions scheduled through July.